Although this sounds great, there is a lot of confusion surrounding the promotion. For instance: will access to this catalog require an Xbox Live Gold subscription? Xbox Live Gold is available for $9.99 per month or $59.99 per year, and is the key to multiplayer gaming on the Xbox platform. Added benefits are free games, via Games with Gold, exclusive discounts, via Deals with Gold, and Party Chat, among some other features. “Deals with Gold” discounts are usually on very old games, and the sale prices are underwhelming when you compare them to PC gaming services like Steam and GoG. Personally, I’m not much of a multiplayer gamer, leaving the main benefit for me to have Gold as the “Games with Gold” free games. These games, typically, are much older or games that failed to get a lot of traction to begin with and are only propped up by in-game marketplaces that should have made the games free-to-play to begin with. At the end of the day, my Gold subscription that I’ve held for over 9 years at this point becomes utterly useless to me. I have no incentive to keep paying so I can get a couple of crappy free games every month, if I can pay a different fee and have access to hundreds of better games whenever I want! I’m of the opinion that this service should have either been bundled free with Gold subscriptions or offered at an extremely reduced rate, like $2 or $3 per month. Just yesterday, before this news broke, I was strongly debating whether I should renew my Xbox Live Gold subscription in a few months when it expires. I would certainly like to see my Xbox Live tenure number change to a 10, that would be great. But at the same time, I haven’t been compelled to keep it for much more than a few free games, most of which I never play. 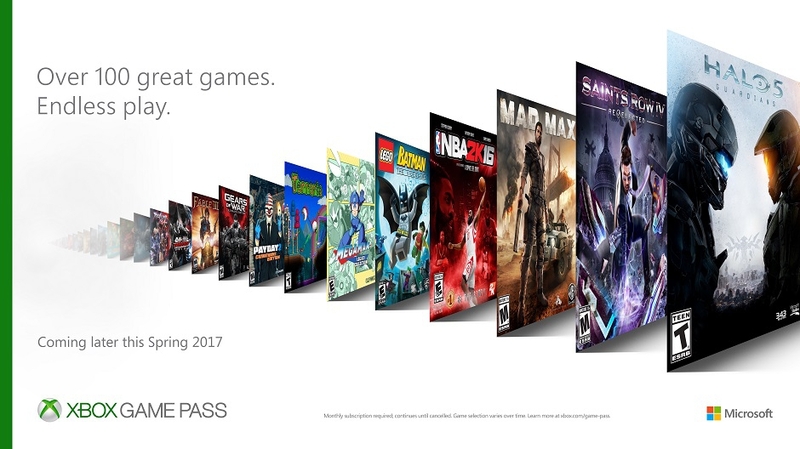 Xbox Game Pass would be a far more compelling service, but I would end up spending more than twice as much per year to access it. If the Xbox Game Pass service had other exciting news, like the option to play these games on your Windows 10 PC, or at least access to Windows 10’s gaming titles, like Gears of War Ultimate Edition, Quantum Break, Rise of the Tomb Raider, etc… then I would be a bit more eager to check it out. But as it stands, it just feels like another money grab, when it could have been made a value-add.